In adults, the most common cause is nephrotic syndrome. In infants, the most common cause is dehydration. An exam may not reveal the specific problem. 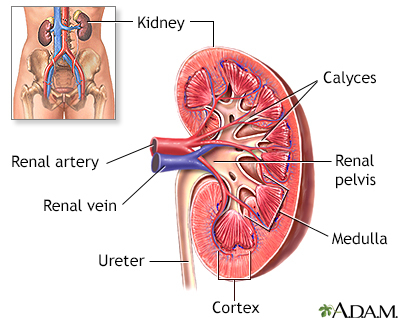 However, it may indicate nephrotic syndrome or other causes of renal vein thrombosis. The treatment helps to prevent the formation of new clots and reduces the risk of clot traveling to other locations in the body (embolization). You may get medicines that prevent blood clotting (anticoagulants). You may be told to rest in bed or cut down on activity for a short time. If sudden kidney failure develops, you may need dialysis for a short period. Renal vein thrombosis most often gets better over time without lasting damage to the kidneys. Call your health care provider if you have symptoms of renal vein thrombosis. In most cases, there is no specific way to prevent renal vein thrombosis. Keeping enough fluids in the body may help reduce risk. Aspirin is sometimes used to prevent renal vein thrombosis in people who have had a kidney transplant. Blood thinners such as warfarin may be recommended for some people with chronic kidney disease. Dubose TD, Santos RM. Vascular disorders of the kidney In: Goldman L, Schafer AI, eds. Goldman-Cecil Medicine. 25th ed. Philadelphia, PA: Elsevier Saunders; 2016:chap 125. Ruggenenti P, Cravedi P, Remuzzi G. Microvascular and macrovascular diseases of the kidney. In: Skorecki K, Chertow GM, Marsden PA, Taal MW, Yu ASL, et al, eds. 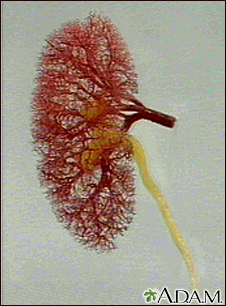 Brenner and Rector's The Kidney. 10th ed. Philadelphia, PA: Elsevier Saunders; 2016:chap 35.